On Monday, May 7, the farrier shod Wizard. We are trying leather rim pads on his front feet. On Tuesday, May 15, I began Wizard’s 28-day treatment with UlcerGard. On May 16, I shot a few video clips of Wizard trotting on the longe. Bad news: he’s still losing weight. Good news: whatever unsoundness he was dealing with has shown improvement. I spoke with the barn owner, and we’re going to make a few changes and see what helps him. We bumped up his grain (short-term solution to him worrying off so many calories when Sunny is separated from him) and are slowly increasing his grass intake. On Friday night, Wizard and Sunny were moved from their quarantine paddock to a small grass paddock. During the day, they are turned out on a two-acre grass paddock, and at night, they have grass in more limited amounts. We are still acclimating them to 24/7 pasture. Wizard’s cribbing has not stopped. On the 2-acre paddock, he cribs very infrequently, but in the smaller paddock, he still cribs with some regularity. I tried another jogging video on Friday morning, this time down the pea gravel driveway. He looked pretty good. I think it’s a combination of the time off and him doing less of a freakout when Sunny is separated from him. I should have seen this coming, but I didn’t. The move from the quarantine paddock to the new grass paddock basically put Wizard back to Square One with his stress level. He was just as bad as he was when he arrived at the farm a month ago. I tacked him up in the outdoor tackup area, and he paced and whinnied each time Sunny called to him. Sunny must have also been stressed, because she did not stop calling for him for my whole ride. Our ride was one of the worst rides in my 3 1/2 year history with Wizard. It took 15 minutes just to get him quiet enough to get in the saddle. I did not want to longe him because I was afraid to twist or strain whatever is wrong with his leg. I’m treading a delicate balance between wanting to keep him focused/working and resting whatever soundness/stiffness/arthritis issue he is having. The moment I settled into the saddle, Wizard was cantering in place, snorting, sweating, champing on the bit. My plan of quietly walking the short sides and trotting the long sides was thrown out the window. The only way I could keep him under control was to work him. We kept the ride to walking and trotting, but it went longer than I wanted, and we did more turns than I wanted. He never truly settled. Every time Sunny called to him, his entire body tensed. He threw a few tantrums when we rode away from her, and I could feel the gravitational pull when we rode toward her. He was so amped up that I could not tell if he was sound or not. I can say, though, that he did not feel lame, for the few stutter steps that I could count out a tempo and feel straightness. When I untacked him, he fought his tie. He was “checked out”, mentally. When a bug landed on him, he threw several bucks in place. When the lead draped over his head, he reared up a little. I am still using the Blocker Tie Ring, so hopefully if he really gets himself in trouble, it will release as needed. I hosed him off, gave him his ulcer meds, and put him back in his paddock. My arms were sore, my arms were bruised, and my hands were blistered. The TDN fates were on my side on Sunday, and I slipped out of work well before dark and headed to the barn. I had two human/equine pairs for my ride this time: Cathy/Miss Tuesday and Kris/Sunny. We all tacked up in the indoor arena since there was a chance of showers. Wizard was very anxious from the very beginning, pacing nervously when he was tied, swinging his hind end from one side to another and swiveling his entire body. He could see Sunny, but he was still stressed. He was worse than he was when we first moved to the new barn. I let him swing around for a few minutes, for my own safety. Cathy suggested longeing him, but I was trying to avoid stressing whatever issues he has with soundness. As he got more and more worked up, I relented and asked him to trot a few rotations on the longe in each direction. His lameness is subtle, but I definitely saw it more on Sunday than on Saturday. His head dips just a bit each time his left front foot hits the ground. Despite my misgivings about the physical strain, the longeing helped him mentally. He was able to stand reasonably quietly while I tacked him up. It took about 15 minutes for him to settle and focus on me. By the end of the ride, he was actually pretty good, seeking contact with the bit and responding well to my leg. His canter was NICE. His trot was pretty good, too. I tried to avoid tight twists and turns and do some of our original plan of walking the short sides and trotting the long sides. After our arena work, we all decided to take a quick walk into the Assunpink. I hand walked him, since he has a freakishly fast walk. If I had ridden him, I would have had to circle him around or stand a lot while the horses caught up with him, and that would have rattled his fragile brain. Wizard surprised me with his calm demeanor in the park. He strided out confidently, and nothing spooked him at all. The waist-plus-high grass had me wishing I had ridden him after all! He had one mental blip, and that was when he lost track of where Sunny was for a moment. When we returned to the barn, it was just about dark. Wizard was able to stand quietly while he was tied, resting one hind leg, with one eye always on Sunny. We untacked in the indoor arena and I put Wizard out in the paddock before Sunny went out. He circled at a frantic trot and canter, calling and snorting until Sunny was back in the paddock with him. All I could imagine was him twisting an already strained leg. I don’t have any diagnosis on what his problem is yet. All I know is that it’s subtle and consistent. It seems to get a little better with rest. 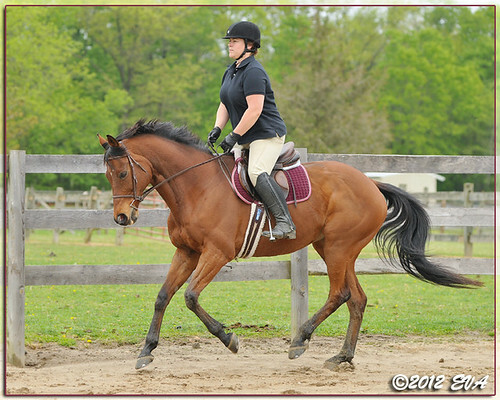 It does not bother him at all- he’s very forward and responsive under saddle. I need to try to get a better video of it so the vet can see it. Normally, I’d have the vet out right away to look at something like this, but I just shelled out big bucks for our ulcer scoping, Lyme Disease treatment, etc etc etc, so I’m monitoring it for the moment and will talk with the vet and see what she thinks. I’m happy to rest it if that is what he needs. This separation anxiety with Sunny has me getting pretty anxious myself. At the old barn, Wizard was the OPPOSITE of a typical herd-bound horse. He could be the only one in the barn, the only one outside, ridden alone in the arenas, ridden alone on trails, without a peep. He was turned out with geldings and they played quite a bit. The last month that he was at the old barn, he was turned out by himself, and was surrounded by mares. I heard from the people who had to work with him that he was a bit of a handful. I’m wondering if he might need to be out with geldings only. I don’t have a lot of evidence, but it seems like mares cause him to lose his mind. I have a particular distaste and lack of tolerance for herd bound horses, so this needs to be nipped in the bud. I can put up with a lot of quirks, but we need to fix this one. For now, we’re keeping him with Sunny and slowly introducing him to other pasture buddies. So far, it’s a non-event. Cisco was in the same paddock, and they barely even looked at each other after they were introduced. The barn owner is hoping that once he’s in a small herd (4 horses), he will not look to Sunny so much for everything. Since the move to the new barn, she turned into his security blanket. We used to ride all over with Sunny at the old barn and there was zero attachment. This all started with the move a month ago. My training plans are vague. Balancing a physical issue with a training issue is very difficult. Wizard does well with more work and handling, but the work that he needs involves circles and transitions. Quiet walking is not in his vocabulary right now. I really would like to get a diagnosis on what is bothering his leg so I could figure out how much work we can do. If I leave him alone to hang around with Sunny, he will just get worse, I fear. He had last weekend off while I went away for a quick trip, and he was pretty anxious when I worked with him after I returned. It’s a delicate balance, and we’re working hard to find it. Wow! You guys are going through a lot! Toby and Ollie became attached as they moved from barn to barn together but nothing like what you’re going through. Then again, they would always go in for feeding and back out together. They are not as needy for each other anymore. Time will be your friend. Hang in there! There *is* a light at the end of the tunnel… right? Ha ha. Just giving him time. And the vet will be out to look at him next Weds.